By Dulce Ruby / 10 December / Travel Stories / 0 comm. What exists today we learn of as though past, and yet we may presently step foot upon sacred grounds, ancient lands and history itself as a story that is still being written. We’ve been blessed, gifted even, to have the honor to interact with and become a part of the story untold by man to this day. OUR STORY, of LIFE ITSELF in the PRESENT. As history itself is static – caught in its illusion & delusion – and therefore lacks explanation and in-depth search of what IS still. And that’s where I begin; to break apart the particles in which make up cultures & spaces praised, glorified, forgotten, and/or changed – shine light on them, research, document, and remember who We ARE, as a people, here & now – beyond media, man-made tales and limitations. During my most recent visit to Mexico, I found mySelf submerged in a culture one would think could only be read of – not experienced first hand, not in this life. Upon arrival, I made friends with the locals almost instantly. Being of full Mexican descent and having grown up with the emphasis on being bilingual by my family (thank you! ), I felt at home and they treated me as so as well. I was in turn quickly introduced to native indigenous people of Mayan culture and felt their excitement of opening their homes (& hearts) to a fresh new, but familiar, spirit & energy. A few days in I was invited to a gathering where I allowed mySelf to remain fully present and felt so much beautiful energy being shared, created, exchanged, and expanded. The finest of silk being ripped to shreds through the jungles of Yucatan. Strand by strand as I dipped, dodged and jumped – my garments tore. I knew I should have worn pants – or anything more appropriate for that matter – and yet I wished for nothing more than to run freely & twirl about in length. Whether in skirts or dresses, it just felt more me – as to raise my vibrations and hold frequency, as though I’d done so all my life(ves). It’s a peculiar matter, considering on this plane it was, in fact, my first visit.. but I knew I was home – just as with any other ‘time’ I find mySelf deep in the playing grounds of Mother Nature. As we arrived at an opening to what seemed like a small cave, I undressed and prepared myself for the unknown. Despite its appearance to the perception of vision alone, this space was infinite; we swam in pitch black for about an hour with tons of bats overhead, and fish within kissing our skin. 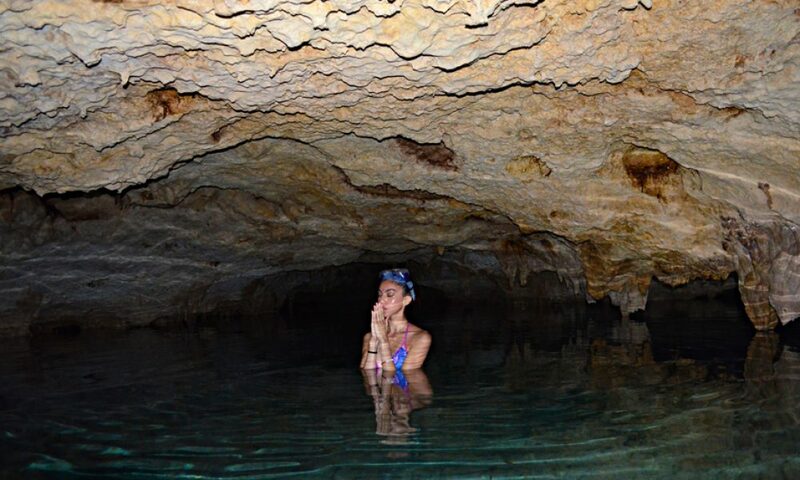 They spoke to me of spirits and energies that exist & guard their lands; that some cenotes are Masculine, and others are of the Divine Feminine. That as we swam, to ask permission to go & reveal further. To respect & show gratitude as if going within Self. – I understood these words; they resonated with my being and zapped me with awakening as they traveled through and prepared me for activation. Once we arrived at a specific pocket of air & energy, they allowed me to turn the flashlight on and here I was. I don’t know how to explain, but I felt beyond. Elevated. Ready… As if initiated into a higher knowing, wisdom, power – reborn and cleansed into Self anew. This is Mayan cultural sacred space within the jungles of the Yucatan peninsula – ‘El Rio Sagrado’ – or translated, ‘the Sacred River’ (not to be confused with ‘El Rio Secreto/the Secret River’ which is near proximity of Tulum). These spaces are held with such divinity, as they were believed to be portals to other realms by the ancient Mayans. ‘Throughout the journey as we venture deeper and deeper into the jungle, below the earth, and through the tunnels – you feel the energy vibrating at high frequencies all around; as if greeting you & happy to have you. It feels ridiculously incredible. I can not find words to explain further what emotions filled me – or the lack thereof. A peace unlike any other, one of knowing and euphoric reveal. Because of this very experience, and refreshed memory of all those prior, I know and have been reassured with what I am doing for the rest of my life – beyond confirmation. I see to it to manifest and live a life of magic, peace, love & adventure (it’s what keeps me balanced), and awaken you to the same vision. At times it may seem as though random, but I assure you the words being shared, stories were written, photos captured – from enlightening posts and reflections to inspirational adventures in this realm (3D/Material/Physical Plane) and beyond – are all relevant to our existence, energy, experience & evolution here on earth. I believe, truly with all of my being, in the balance of Life. That our darkness & light meet & reflect. That the peace & thrill evolve into the greatest of manifestations. A waking life, a fantasy-like reality. A world where mankind is still kind and sacredness is as homes are – being opened – with excitement, love, purity… joy. Where we are welcomed into hearts and drawn into all characters as we reflect our Light through mirrored energy. May we see no bounds. May we know no fear. May we be at peace, always. May the people & places of the ‘past’ live on through every tale we continue to record, document & share, here & now. May We remember to re-member. I’m just here to remind you to remember.